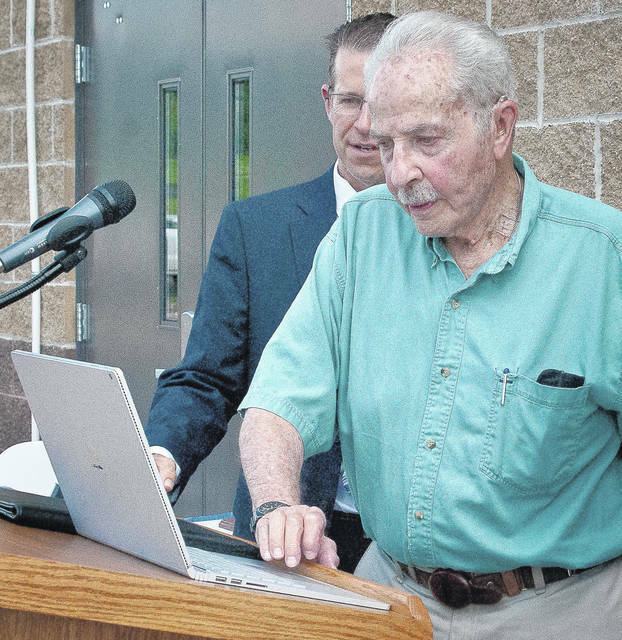 Lawrence R. Schreiber had the honor of pushing the button to start the pumps to pull raw water from the O’Shaughnessy Reservoir and move it to the Olentangy Water Treatment Plant. There are 20-by-6 screened water intakes located 10 feet under water in the O’Shaughnessy Reservoir. To clean the screen of leaves and sediment, air is blown back through the intake pipe, blowing the leaves and muck from the screened area. Located on Home Road along the Scioto River, the Lawrence R. Schreiber Pump Station blends into the background of the scenery on the bank of the O’Shaughnessy Reservoir. The Del-Co Water Company dedicated the multimillion-dollar Lawrence R. Schreiber Pump Station before a small band of board members, residents, and local government officials during a ribbon-cutting ceremony held May 31. 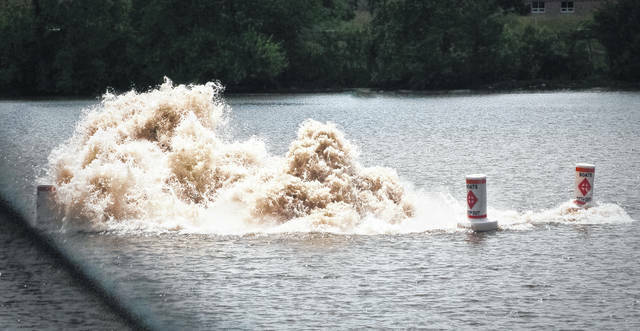 The new pump station is located on the east bank of the O’Shaughnessy Reservoir at the intersection of Home Road and state Route 257, south of the bridge. “I’m impressed with the facility we have here today,” said Lawrence Schreiber, namesake of the new facility and a 37-year veteran of the Del-Co Water Company Board of Directors. Scheiber said he developed a quick interest in the water supply business when he turned the handle on the water tap and nothing came out. He said Del-Co was started by selling 600 memberships at $75 each. Scheiber received the honor of starting the pumps with a push of a button on a laptop computer from the podium. The $7 million pump station was constructed by Peterson Construction, while the $5.8 million raw water pipeline for the project was completed by Trucco Construction in 2016. Engineering for the project was provided by MS Consultants. Dan Barr, a design engineer with MS Consultants, said construction included 72,000 feet of 36-inch pipeline that travels along Home Road from the pump station to the Olentangy Water Treatment Plant on Olentangy River Road/state Route 315. He said the dual, 8 million gallon pumps will provide 16 million gallons of raw water per day to the treatment plant. 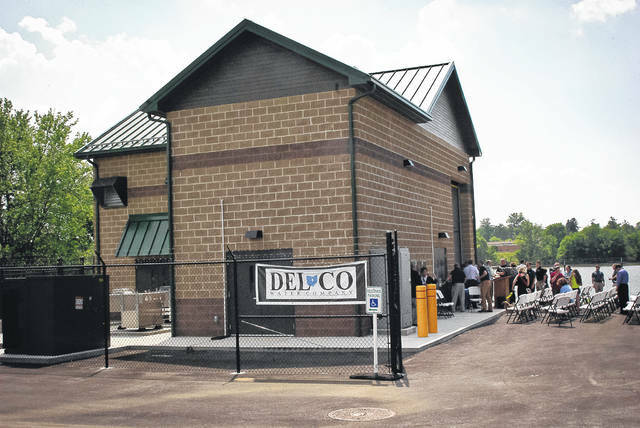 According to Glenn Marzluf, Del-Co general manager and CEO, in the future, the pump station will provide for over a decade of growth in Delaware County and the other areas served by the water company. The Mid-Ohio Regional Planning Commission predicts as many as one million additional people will locate to the central Ohio region by 2050, and many will locate north of Columbus in the company’s service area. The project was a partnership with the City of Columbus Department of Public Utilities and Department of Parks and Recreation. The land the pump station sits on is owned by Columbus. The precursor to this project was completed in 2014, a 9.3 billion gallon raw water storage reservoir costing $120 million — the John R. Doutt Upground Reservoir. It borders both Union and Delaware counties upstream from the pump station. The Del-Co Water Company is a member-owned nonprofit drinking water utility serving a population of about 140,000 in Delaware, Morrow, Marion, Franklin, Union, Knox and Crawford counties in central Ohio. Del-Co was recognized May 22 for the “Best Tasting Water” in the state of Ohio by the Ohio Rural Water Association. The competition occurred on May 8 at the ORWA Annual Water Conference in Dublin. This entry was tagged D. Anthony Botkin, Dan Barr, Del Co Water, Glenn Marzluf, Lawrence R. Schreiber Pump Station, Mid-Ohio Regional Planning Commission, MS Consultants, Trucco. Bookmark the permalink.